Join us on Boston's ORIGINAL Martha's Vineyard day trip! We are Boston's #1 day trip service to the island since 2011. Our professional guides, approved Boston Hotel pickups and newer air-conditioned mini-coaches will help provide you with the personalized passenger experience that our guests truly deserve. Transportation to the island has never been this easy! You will also receive complimentary snacks, bottled water, island guidebooks and a discount card with some island perks! Once on the island, explore on your own or upgrade with our 3 hour fully narrated island tour. Let us help you Discover Martha's Vineyard! Get picked up from your Boston hotel in a mini-coach for a comfortable and relaxing 1.5-hour ride to Falmouth. Water, a light morning snack, and light commentary will be provided. Once in Falmouth, you'll be dropped off at the Island Queen Dock where you'll board the passenger ferry. Your ferry ticket is included so you won't have to wait in line at the dock. Relax on a short 35-minute mini-cruise as you sail across the sparkling waters off the coast of Massachusetts. You will arrive at the island of Martha's Vineyard around 9:30am. You will then have approximately six hours to explore Martha's Vineyard on your own. Your bus driver will be happy to provide you with more information and maps of the area should you wish to book additional activities. Upgrade to a 3-hour narrated island tour to get an initial overview of the island. On the tour you will have a 15-20-minute stop at the Gay Head cliffs in scenic Aquinnah, where the first lighthouse was built. 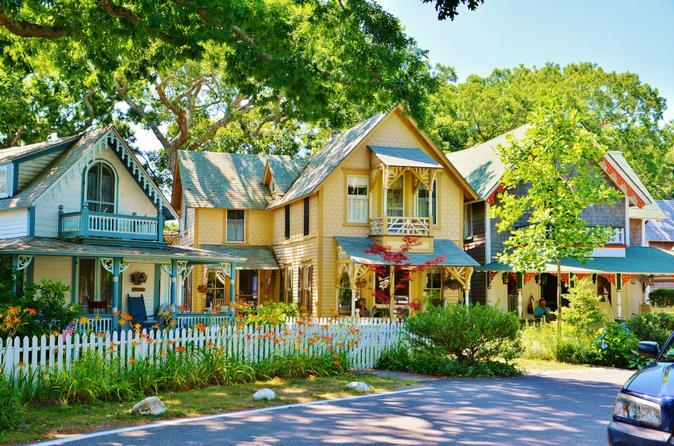 Next, you'll pass through the beautiful historic village of Edgartown. Along the way, enjoy the commentary from your professional tour guides as they share their knowledge of the island's history and present-day events. You will then have approximately 2.5 hours to explore Martha’s Vineyard on your own. Upon completion of your day on the Island, you will board the ferry which departs at 3:45pm for a relaxing sail back to Falmouth, where the shuttle will be waiting to complete the final leg of your unforgettable day trip experience. A light snack and water will be provided on your trip back to Boston.